To celebrate this spooky day I thought I’d turn my attention to black rice – the mysterious cousin to regular brown or white rice varieties. So what is black rice? Well, it’s a type of rice, obviously, but due to its deep purple-y black colour, it’s said to be the healthiest rice on rice street. When rice is processed, the outer layer is removed, taking with it many important nutrients. So, while brown rice is better than white rice, it’s black rice that really takes the prize as it’s packed with anthocyanins – a type of antioxidant that’s also found in blueberries, purple grapes, acai berries, raspberries, blackberries and more. As the majority of nutrients are found in the bran of the rice, look for wholegrain varieties to ensure all the goodness is still in tact. It’s in the bran that you’ll also find all the vitamins, minerals, phytochemicals and fibre that will help boost your health. Step 1: Prepare your nuts the day before. You can activate a huge pile of nuts in advance and use them to garnish your porridge. Simply soak your nuts (I like activated almonds) overnight in water and a little bit of rock salt to breakdown the phytic acid and enzyme inhibitors that make digestion hard on the body. In the morning, drain the water and spread nuts out on a baking tray and place in the oven on the LOWEST possible setting (60C) to dry out. Once done, remove from the oven and spread on your porridge. Store the rest of the nuts in an airtight container. Step 2: Soak and rinse your rice. Then, cook per the packet instructions. Once done, stir through your coconut milk, add your fruit, nuts and even some seeds on top and eat. Enjoy! Step 1: Soak and rinse the rice. Cook the rice as per the instructions and leave aside to cool. Step 2: Cut the tempeh into chunks and steam for about 8 minutes. While you’re doing that, toss the onion and garlic into a fry pan with coconut oil and allow to sweat and slightly caramelise. Throw in the tempeh and cook for a few more minutes until golden brown. Step 3: Throw all the vegetables into a bowl and mix. Add the fresh herbs, chilli and sesame seeds. Add in the black rice and tempeh before tossing the entire salad in your dressing. Enjoy! 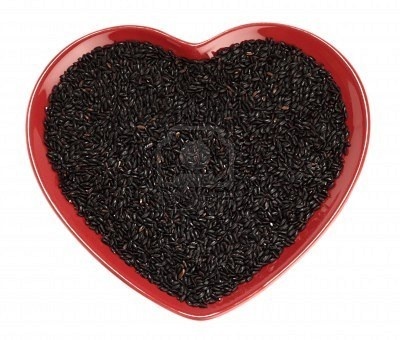 Have you tried black rice? What do you think of these black rice recipes? 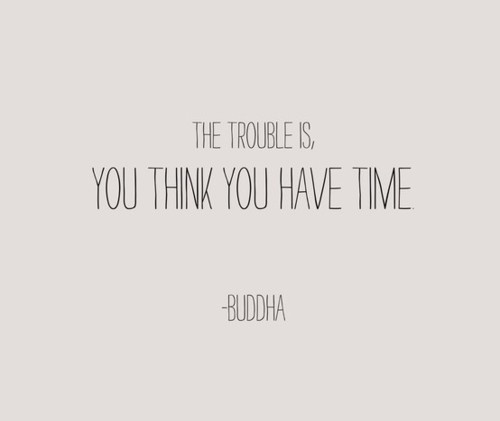 Don’t Live For Tomorrow, Live For Right NOW! Since a tragic accident left a friend of mine critically injured a few years back, I’ve always tried to live by the whole ‘don’t take life for granted’ mantra. But it’s an easy one to slip in and out of, as the busyness of life gets in the way of treasuring each and every moment, proving it’s hard to remain present. But something happened on the weekend that jolted me back to reality. My dad suddenly blacked out and fell over, hitting his head on a cement step and ending up looking like he’s gone ten rounds with Mike Tyson. He’s fine, luckily, but as the family gathered around to be by his side at the hospital, we all came to realise just how precious life is. There’s such a fine line between normality and tragedy – step a little too far over to the left and your world comes crashing down. Stay on the right and things carry on as usual. Now that the shock has settled down and we’re getting used to seeing dad lying in a hospital bed with two black eyes, a swollen forehead and grazes all over his face, the questions and what ifs start crashing their way into our mind. Why did this happen? Did his heart just stop? Is there something going on with his brain? What if he’d fallen and hit the back of his head? The scenario would be so different. Imagine if he was driving. Then what??? But there’s plenty of lemonade to be made from these particular lemons and as a firm believer in everything happening for a reason, we’ve all come to the conclusion that dad was, in fact, incredibly lucky. Despite the odds, nothing was broken (which, if you saw his face, is a miracle), it has allowed the doctors to explore a potential heart irregularity that may not have been picked up had said incident hadn’t happened, and of course, it’s made the entire clan look around at each other and realise that there are only a few simple importances in life. Your family. Your values. Your experiences. 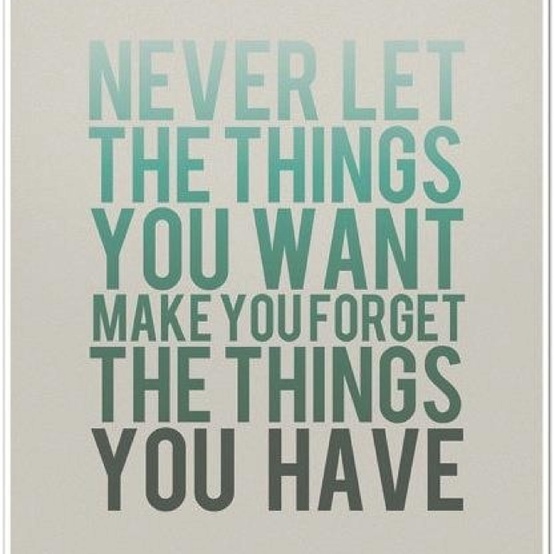 So often we are clouded by the things we want that we forget the things we already have. So if you live your life looking backwards, compare yourself to others, hold onto regrets, or are too scared to step into the life you really want to live, now is the time to consider change. Because there’s no point waiting for tomorrow, there’s no certainty it’s going to come. My dad has been making Turkish-style spinach and beef for my entire life and it never disappoints. It’s a glorious mix of greens and spices and rich tomato sauce, all tied together with lovely pieces of beef to, well, beef it up. 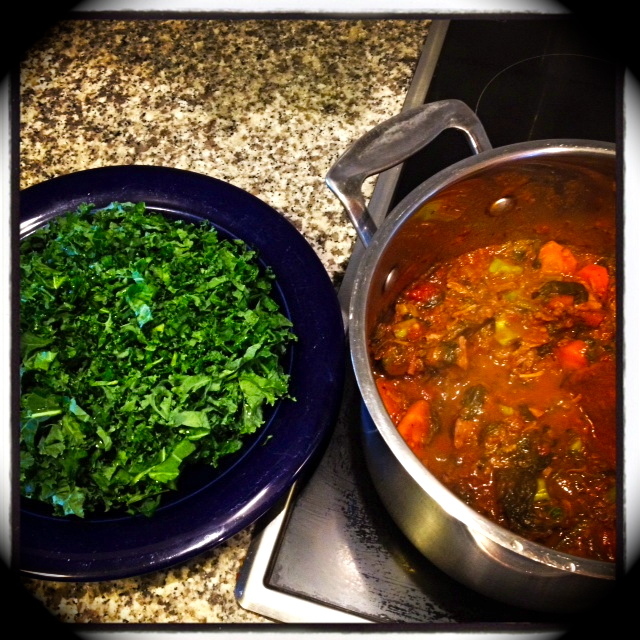 I’ve made some modern-day adjustments to factor in the likes of my wholefood kitchen, including switching pilaff for a bed of raw kale and choosing grass fed beef over mince. That said, good quality mince would also work really well with this dish. 1 x large bunch of spinach, washed and cut. Keep the stalks as well, they work a treat in the dish. Throw your onion and garlic into a large, heavy bottom saucepan on medium heat. Leave to sweat for about 5 minutes. Now, toss your meat cubes in and brown off. Add your spices and salt and pepper to the onions, garlic and meat and cook for a few more minutes, before adding your tomatoes and a cup of water. The liquid should just cover all the meat and onions. Bring back to the boil and turn down to low heat, cover, and cook for about 3-4 hours. The slow cooking makes the meat melt in your mouth and is so worth waiting for. Alternately, you can throw this dish in a pressure cooker to speed up the process, or in a slow cooker before you head off to work. Once your meat is soft, add the carrots and spinach and cook for another 30 minutes, leaving the lid off for the remainder of the cooking time. This just lets it reduce a little. Finally, squeeze in your lemon and serve on a bed of raw kale, brown rice or baked eggplant. Enjoy! What do you think of this Turkish-inspired dish? On Saturday I held my first yoga/beauty workshop with the delightful Nadia Rihani from Yoga Village. It was an incredibly girly day of pampering, insightful skin tips, yoga and pranayama breathing, but one of the stand-out activities of the day was when we all got to make our own face masks. Yep, out came the banana, honey, yoghurt and fruit as we all mix and talked and laughed and…masked. It is such an easy thing to do at home, plus, you don’t get any more natural than the real deal. To follow up, I went on Mornings today to show Australia how a little pantry play-time really can get your skin glowing. Have you ever made a face mask at home? When I mention the word bread there’s often two reactions: I don’t do carbs or I don’t do wholegrain. Only white. It’s sad really, that the ancient art of bread making has been whipped with the ‘carb’ stick or refined into a sugary, processed shadow of its former self. But centuries ago, they knew where it was at. Or at least, the Essenes knew where it was at, creating sprouted breads made from grains, seeds, berries and other yummy treats that worked in line with their raw, vegetarian palettes, as well as their healing lifestyle. Since then (they say the bread has been around for 6,000 years) essene, or sprouted breads, have been pushed aside in order for more sugary, processed and less nutritious options to be hailed as THE bread to eat. But now, sprouting is slowly making its way back into the mainstream, with switched on health types realising that sprouted grains in all their forms are nutritious, easier to digest and, in many cases, eliminate bloating and insensitivity to grains altogether. Plus, raw foodists LOVE this technique as there’s no cooking required (although some of the breads are baked, sprouted grains can be soaked and then swiftly eaten. Nothing to do in-between). But what is sprouted bread? Sprouted bread has many different forms, but essentially, it’s a loaf of ‘bread’ compiled by grains that have been sprouted, rather than processed, refined or ground down. The processing of grains involves removing the bran and the germ in order to preserve the grain so it lasts longer. However, this also happens to strip the grains of essential nutrients, leaving you with, well, not much at all. The sprouted bread I eat contains seeds, coconut, magnesium, neem and, depending on the day, garlic, olives or even fruit. It doesn’t really feel or taste like traditional bread that you get from the bakery or supermarket, as they often don’t contain flours, salt, sugar, gluten or other known irritants found in conventional loaves. Just the good stuff! In short, sprouted bread is higher in protein, enzymes and vitamins than most conventional breads. They are also low GI, so you know, they release slowly into your body leaving you fuller for longer. By sprouting your grains, rather than processing them, you are keeping all those delicious nutrients, vitamins and enzymes in place, allowing the entire grain (the germ, endosperm and bran) to slowly, naturally, do its thing. While the sprouted bread I eat doesn’t contain wheat, it has been said that sprouting wheat breaks down lectins so it’s not as irritating on your gut. Sprouted brown rice can help fight diabetes. 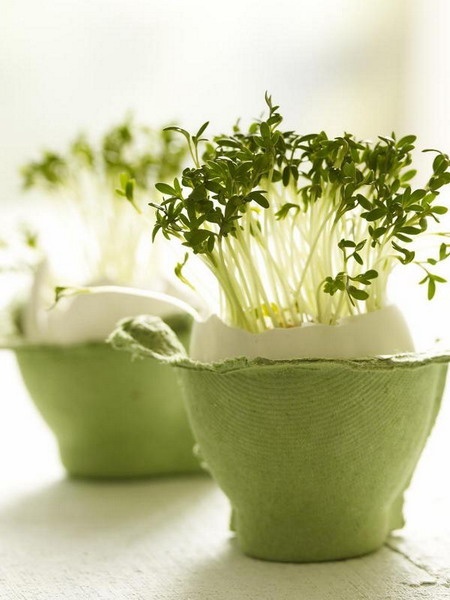 Sprouted buckwheat can protect against fatty liver disease. It’s said cardiovascular risk reduced by sprouted brown rice. Many say sprouted brown rice decreases depression and fatigue in nursing mothers. Decreased blood pressure has been linked to sprouted barley. What’s that? You’re sold. Where can you buy it? If you live in Sydney’s Eastern Suburbs head to Suveran on Oxford St. in Bondi Junction. Start by sprouting your grains of choice. Try millet, quinoa, wheat or buckwheat. Whatever you like, just buy the whole grain, place it in a tray and cover them with water. Be sure to change the water everyday to ensure your grains don’t rot. Let them sit in a cool, dry place for 2-3 days. Once done, lightly blitz your grains (your want about 1 cup of each grain) in a food processor with 1/2 cup of water, 1 tbls coconut oil and any other additions you want. Olives, garlic, thyme, fruit…play around. Once all the ingredients are mixed, simply shape and place into a lined loaf tin and bake for an hour in an oven of 150-180 degrees. If you wanted to go raw, place it in the tin and let it dehydrate for a few days. It’s up to you.